↑ "Total Population - Both Sexes". World Population Prospects, the 2015 Revision. United Nations Department of Economic and Social Affairs, Population Division, Population Estimates and Projections Section. July 2015. अभिगमन तिथि 1 June 2016. 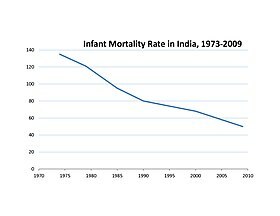 ↑ "Birth Rate, Death Rate, Infant Mortality Rate and Total Fertility Rate: India and States". National Commission on Population, Govt of India. 2010. ↑ "Census India SRS Bulletins". Registrar General of India, Govt of India. 2011. ↑ "Census India SRS Bulletins". Registrar General of India, Govt of India. 2013. ↑ "Soutik Biswas's India: India's census: The good and bad news". BBC. 31 March 2011. अभिगमन तिथि 2011-09-24. ↑ "India set to overtake China as world's most populated country after adding 180m people in a decade". Daily Mail. London. 31 March 2011. ↑ US Census Bureau, Demographic Internet Staff. "International Programs – Information Gateway – U.S. Census Bureau". Census.gov. अभिगमन तिथि 2011-09-24. ↑ Based on P.N. 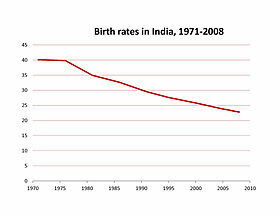 Mari Bhat, "Indian Demographic Scenario 2025", Institute of Economic Growth, New Delhi, Discussion Paper No. 27/2001.